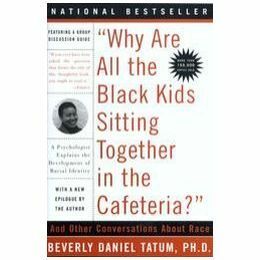 For February Book club we will be discussing: Why Do All the Black Kids Sit Together in the Cafeteria? by Beverly Daniel. See below for more on the book, talks with the author, and resources for antiracism work in many contexts! This insightful exploration of the varieties of Americans’ experience with race and racism in everyday life would be an excellent starting point for the upcoming national conversations on race that President Clinton and his appointed commission will be conducting this fall. Tatum, a developmental psychologist (Mt. Holyoke Coll.) with a special interest in the emerging field of racial-identity development, is a consultant to school systems and community groups on teaching and learning in a multicultural context. Not only has she studied the distinctive social dynamics faced by black youth educated in predominantly white environments, but since 1980, Tatum has developed a course on the psychology of racism and taught it in a variety of university settings. She is also a black woman and a concerned mother of two, and she draws on all these experiences and bases of knowledge to write a remarkably jargon-free book that is as rigorously analytical as it is refreshingly practical and drives its points home with a range of telling anecdotes. Tatum illuminates “why talking about racism is so hard” and what we can do to make it easier, leaving her readers more confident about facing the difficult terrain on the road to a genuinely color-blind society. — Copyright ©1997, Kirkus Associates, LP. All rights reserved. –This text refers to an out of print or unavailable edition of this title. Feel free to add comments with suggestions for more books and resources!